The most incredible Red Velvet Cake with Cream Cheese filling and frosting is fluffy, soft, buttery and moist with the most perfect strawberry taste made with real strawberries! Today is my daughter’s 20th birthday. Happy Birthday Elia!!! A few weeks back she told me she saw some cute pink hearts in a chocolaterie, which is not very far away from my house. One day when I was passing from there I bought some for her, as well as bitter chocolate to have it when I would be making her birthday cake. However, when I asked her what kind of cake she wanted this year for her birthday she told me she didn’t want it to be a chocolate cake and she would love something with red fruit. As there are always strawberries during March, most of the cakes I make for Elia’s birthday have strawberries, I was thinking raspberries this year but unfortunately the supermarket where I can get some are far away. The past weeks have kept me away from blogging as after I recovered from a cold and back ache, my husband is now having health problems and is still being treated in hospital. It’s hopefully nothing serious but this is keeping me very busy having to go twice a day, plust having all the other responsibilities of cooking, cleaning, shopping, etc. My husband usually does the shopping and he would normally drive me there, as I have stopped driving ever since we moved to Athens, so raspberries were out of the question and it’s stawberries again. Those pink chocolates I bought a few weeks ago inspired me to decide to make a Red Velvet Cake. I made a quick google search and based my recipe one I found at The Joy of Baking. The final result was amazing although the batter was a little bit runny and I had to add a couple more tablespoons flour. I used around 300 grams as my eggs were big (around 75 grams each). I started this cake three days ago making the strawberry coulis one day, the cakes the next day, the filling and frosting yesterday and today the syrup and decoration. An amazing red velvet cake sandwiched with strawberry cream cheese filling and topped with cream cheese frosting. Strawberry Coulis: Wash and hull the strawberries and place in a non stick frying pan. Add the sugar, strawberry (or other) liqueur and honey and simmer for about ten minutes, stirring from time to time until the syrup is thick. Set aside until it cools. Red Cake: Preheat oven to 350 degrees F (175 degrees C) and place rack in center of oven. Butter two - 9 inch (23 cm) round cake pans and line the bottoms of the pans with parchment paper. Set aside. In bowl of your electric mixer, or with a hand mixer, beat the butter until soft (about 1-2 minutes). Add the sugar and beat until light and fluffy (about 2-3 minutes). Add the eggs, one at a time, beating well after each addition. Scrape down the sides of the bowl.Add the vanilla extract and beat until combined. Cream Cheese Filling: In the bowl of your electric mixer, or with a hand mixer, beat the cream cheese and heavy cream until smooth. Add the vanilla and confectioners sugar and beat until smooth. Remove about 1/3 of cream cheese for the frosting. In the remaining add the strawberry coulis and mix until incorporated. Remove to a bowl and refrigerate. Cream Cheese Frosting: In the bowl of your electric mixer, or with a hand mixer, beat the heavy cream with 2 tbsp icing sugar until peaks form. Add reserved cream cheese and mix. Refrigerate. Strawberry Syrup: Cut the strawberries into small pieces. In a small frying pan add all the ingredients and bring to boil. Cook for 5 minutes. Assemble: With a serrated knife, cut each cake layer in half, horizontally. You will now have four cake layers. Place one of the cake layers, top of the cake facing down, onto your serving platter. Wet all four pieces of cake with strawberry syrup. Spread the three cakes with a layer of strawberry frosting. Add some of the strawberry pieces from the syrup. Place the last layer of cake on top and cover with the white frosting on the top and sides of the cake. Reserve some whipped cream and mix in a drop of red colouring to make the pink decoration. 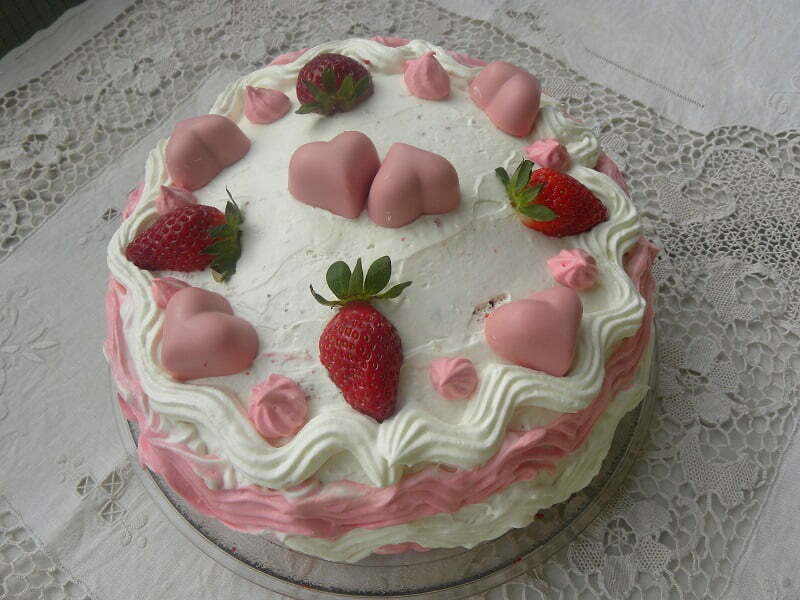 Garnish the cake with strawberries and heart shaped chocolates. If you want some inspiration to make a Birthday Cake, here are a few more cakes I have made! A moist, buttery and subtly flavoured lemon sponge, with pastry cream between the layers and topped with salted caramel and whipped cream. This Valentine's Dark Chocolate Cake is rich and delicious. It is super moist, filled with cream cheese, whipped cream and sour cherries and gets all its flavour from the sour cherries. Happy Birthday to your daughter! The cake looks so pinky and pretty! That cake is magnificent! You are such a thoughtful mother. That’s quite the cake. There are a lot of steps, but it looks so worth it and the result is gorgeous. Ivy, this looks beautiful and you’re so clever building such a tasty number around these chocolate hearts. I’m sure it melted Elia’s. Happy 20th birthday to your daughter. She’s lucky to have such a talented Mum. Love the combination of pink here! Great lookin’ cake! What a beautiful cake! Happy birthday to your daughter. I hope your husband feels better soon – did he miss this beautiful cake?! Wow, that’s a beautiful cake!! Ivy, such a beautiful cake, so elegant! Love how you decorated and the strawberry in it. Happy birthday to your daughter. She’s lucky to have a mom who’s so talented in the kitchen! That looks delicious. Hope your husband gets well soon. What an amazing cake Ivy! Wishing your daughter a belated birthday and perastika to your husband too! I made a really great version of red velvet cake when I was in culinary arts school, but I’m certainly going to have to try this one. The one I made was a traditional red velvet, but I like the strawberry spin of this one. Yummy! This cake looks great and I love strawberries. I’ll give it a try in week-end, fingers crossed to get it right, as my mouth is already watering…Thanks for sharing the recipe! Strawberry velevet cake is my favorite. I think this cake is very moist and delicious. I will ask my wife to get the recipe. Thanks for the post! Wow, Ivy, what a gorgeous cake! Lucky daughter! And Happy Birthday to her! Stunning cake and what wonderful flavors. I love the Joy of Baking site (even if you did have to adjust the recipe). Beautiful! You’re an awesome mom! I always just buy everything for my family 😛 But hey it tastes good ! Although i know it’s made.. I have been inside a confectionery – it’s all pre-made. They just putt everything together. wow pretty yummy cake !!! I’m mouth watering just by seeing the picture.. Thanks for sharing recipe. Will try it out. These yummy cakes gonna kill me , i would buy and have delicious cake rather than preparing it. Happy Birthday Elia. This looks like a wonderful cake!